Catalogue with full colour illustrations/unpaginated for the Turner Prize exhibition of 2013, held at Ebrington, Building 80/81, Derry/Londonderry, 23 October 2013 - 5 January 2014. 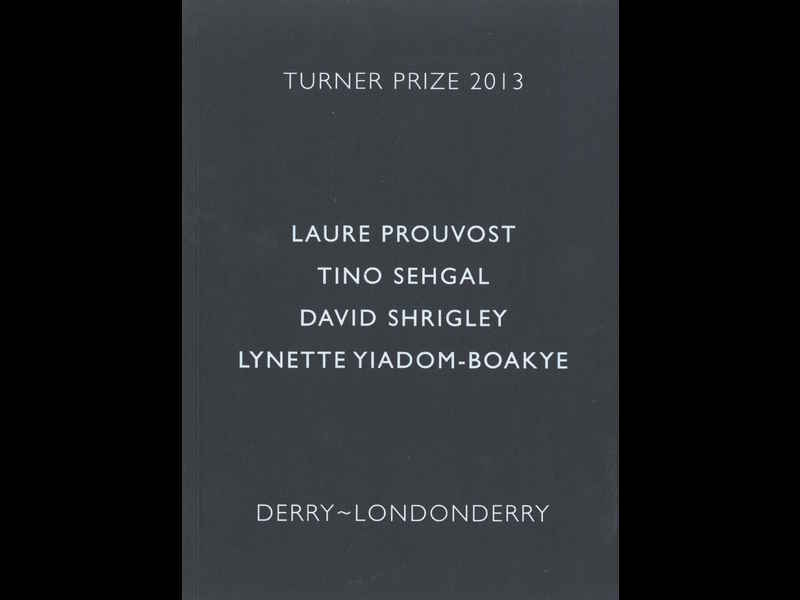 Along with Laure Prouvost, Tino Sehgal, and David Shrigley, Lynette Yiadom-Boakye was shortlisted for the Turner Prize 2013. The jury consisted of Penelope Curtis, Director, Tate Britain, and Chair of the Jury, Annie Fletcher, Curator of Exhibitions, Van Abbemuseum, Eindhoven, Susanne Gaensheimer, Director MMK Museum für Moderne Kunst Frankfurt am Main, Declan Long, Writer and Lecturer, National College of Art and Design, Dublin, and Ralph Rugooff, Director, Hayward Gallery, London. The award was, in due course, made to Prouvost. All the above quotes come from the introduction to the Turner Prize catalogue, which also contained introductions - both written and visual - to these artists’ work. Brief introductions to the shortlisted artists. Note at the front of the catalogue: “The Turner Prize will be awarded in Derry-Londonderry on 2 December 2013, during a live broadcast on Channel 4, to an artist under fifty, born, living or working in Britain, for an outstanding exhibition or other presentation in the twelve months before 16 April 2013. The Turner Prize exhibition of 2013 was held at Ebrington, Building 80/81, Derry/Londonderry, 23 October 2013 - 5 January 2014. 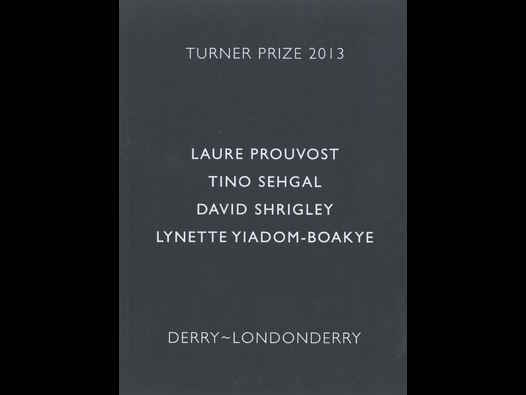 Along with Laure Prouvost, Tino Sehgal, and David Shrigley, Lynette Yiadom-Boakye was shortlisted for the Turner Prize 2013. The jury consisted of Penelope Curtis, Director, Tate Britain, and Chair of the Jury, Annie Fletcher, Curator of Exhibitions, Van Abbemuseum, Eindhoven, Susanne Gaensheimer, Director MMK Museum für Moderne Kunst Frankfurt am Main, Declan Long, Writer and Lecturer, National College of Art and Design, Dublin, and Ralph Rugooff, Director, Hayward Gallery, London. The award was, in due course, made to Prouvost. Note at the front of the Turner Prize 2013 catalogue: “The Turner Prize will be awarded in Derry-Londonderry on 2 December 2013, during a live broadcast on Channel 4, to an artist under fifty, born, living or working in Britain, for an outstanding exhibition or other presentation in the twelve months before 16 April 2013.